Attractive Power: the external environment of a think tank. A favorable external environment can attract more resources and enhance attraction of the evaluation object. Management Power: the ability of managers to manage and develop a think tank. Impact Power: the direct expression of a think tank and the ultimate embodiment of the two aforementioned powers above. The three components are combined into the "AMI Index". 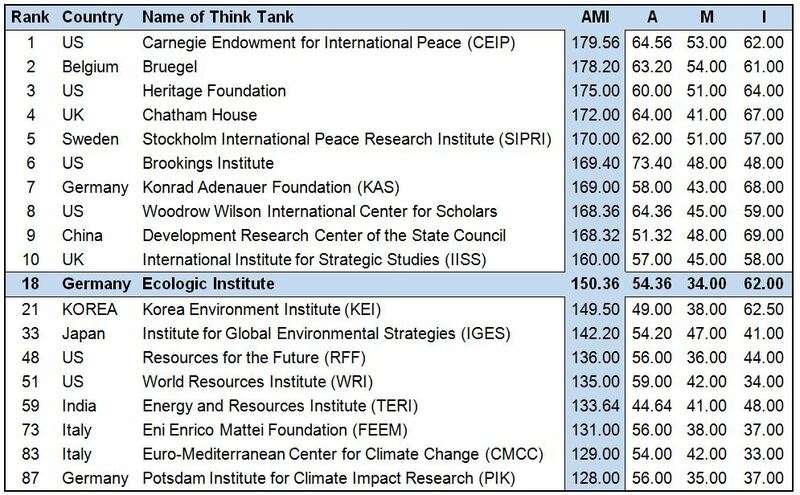 The ranking confirms the international standing of Ecologic Institute that is expressed also in other rankings, such as the annual Global Go To Think Tank Index Report of the University of Pennsylvania, or the ICCG Climate Think Tank Ranking by the International Center for Climate Governance (ICCG). CASS published a short news article covering the launch of the CECHSS ranking.